Ever watch Gravity Falls and think, man, that Stan sure is hot? Well, indulge that thought by playing this Grunkle Dating Sim, a Gravity Falls fangame! 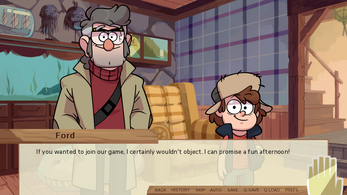 A summer road trip leads to an unexpected pause in Gravity Falls. Can you capture the heart of one of the Mystery Shack’s most eligible bachelors? Or will you leave empty handed? Approx. 65,000 words of sweet, sweet romance! Ten never-before-seen illustrations, featuring your favorite Grunkle! 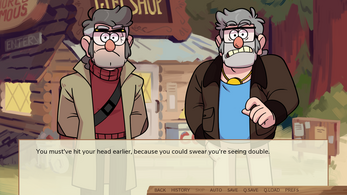 The opportunity to date your choice of Stan or Ford (but not both at once)! And yes you get to choose your pronouns! Head over to our blog's FAQ page if you have questions, and help page if you don't know how to run the game/have trouble running the game! I made the game with the help of twelve artists and writers, whose blogs you can find listed here! This is a fan project made out of love for Gravity Falls and its characters, copyright of which belongs to Disney and Alex Hirsch. We do not claim any ownership over Gravity Falls, and do not profit from this fan project. "What's that sound_patch file for?" It adds a handful of brief sound effects and voice clips to the game! Installation instructions are included. There are no audio files in the introduction, and they show up occasionally after that. A little over 10 audio files play in total. I downloaded the game.. so how to I play?? I absolutely love the game! From the graphics to the little details that burst me into uwu. You did a really amazing job. Thank you so much! 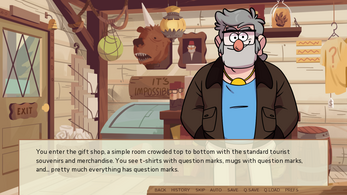 Never expected a full-fledged dating sim about the Grunkles to ever exist nor did I expected it to be good. But boy am I happy this is a thing, finished both routes in a day. Good writing, impressive illustrations. I really enjoyed this a lot. Damn, this is like, a full-fledged game??? I really like it??? This game was honestly so cute as I played through both choices of Stan and Ford! Honestly made me smile!! Thank you so much for making this! It's super cute~ I knew someone else in the world would understand my love for difficult old men. When can we expect a Grampfather Staniel Update/ Expansion? it's the main reason i made an account, tbh- i just really wanted to say how much i absolutely adored this!!! thank you for the radical experience!!! I feel like I'm a little late in writing this, but thank you so much to everyone on the team! The writing was so beautiful and all the dialogue and the conversations felt so real and genuine. All my compliments belong to this wonderful game! That's wonderful to hear, thank you so much! I've passed this on to the team as well! I made an account in this just to add this comment. Oh my gosh this is incredibly sweet to hear, thank you so much!! I feel like I'm gonna be flipping back to look at your comment for days to come;; and I'm glad you enjoyed the game! this game is honestly hilarious thank you for making this!! 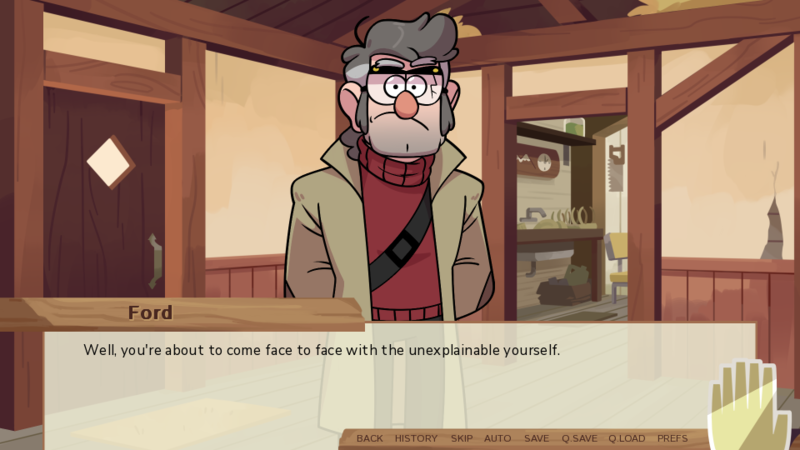 The Stans were never my favorite characters or characters that I would think about swooning, but this is still a great and entertaining game nonetheless.